Ronald Kruwinus studied Landscape Ecology and Nature Conservation at the University of Greifswald and earned his diploma in 2012. 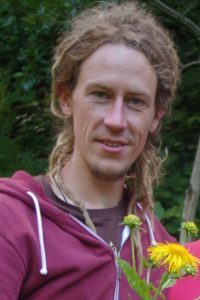 Having a broad background in vegetation ecology and sustainable land use, his scientific interests expand to social and solitary bees as well as functional agro-biodiversity. Ronald has been working in various projects in Europe and Asia, gathering experiences in the fields of sustainable pasture management, organic agriculture, climate change education, capacity building and rural development. His work experience is interspersed by extensive educational journeys throughout Asia, with the focus on exploring the diverse forms of land use under varying ecological conditions. In recent years, Ronald concentrated his activities in Georgia, where he coordinated an educational program on beekeeping and operated as agricultural advisor for the NGO “Mosavali”. Besides this, he collaborated in several pasture management projects through field assessments, training of field ecological methods and reporting. Ronald joined ESTOK as a fellow in 2016.